This Jamie Oliver Cookbook " Cook With Jamie - My Guide to Making You A Better Cook" has wonderful simple recipes full of natural flavor. As with his other books, the photos are simply beautiful and it's a joy just to browse through the cookbook. 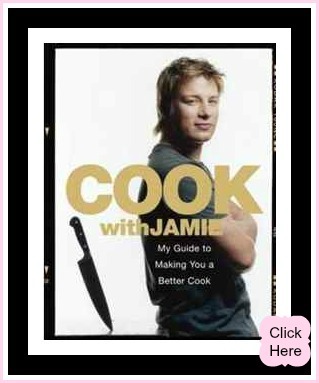 Jamie Oliver's career started as a chef at the River Cafe, where he was quickly spotted by the television company that made him famous as The Naked Chef. He has since published a huge range of bestselling cookery books, including "The Naked Chef", "The Return of the Naked Chef", "Happy Days with the Naked Chef", "Jamie's Dinners", "Jamie Does", "Jamie's Ministry of Food", "Jamie's Kitchen", "Jamie at Home", "Jamie's Italy", "Jamie's Great Britain", "Jamie's 30 Minute Meals" and "Jamie's 15-Minute Meals". "I've really tried to make it a timeless, modern-day classic. Whether you're a student, a young couple, an established cook or a novice, I'll take you through a whole load of simple and accessible recipes that will blow the socks off your family and any guests you might have round for dinner. " This cookbook has his trademark chatter box style of prose and the pages "talk" to you in a friendly approachable tone. I love the photos and his unpretentious manner of his personal look and that he makes cooking uncomplicated and as he says, accessible. Top gear that makes a difference in the kitchen - and he lists and describes basic essential equipment, which I too consider a must for any cook. Th World of Salads - where Jamie explains how to understand flavors of the bits that go in a salad, from cheese to nuts or toasted seeds. The Magic of Pasta - I love how Oliver explains what pasta is made of and how we too can make pasta in our kitchens and how to achieve the wonderful flavors in pasta and fillings. What I like about this section is that the making of pasta can be easy and delicious. All About Meat - What an excellent chapter! Oliver explains the breeds, rearing and feeding as well as the importance of hanging the meat, besides clear drawings and notes on the various cuts of meat. This valuable information makes it easy to understand the right cuts of meat for slow cooking, roasting or sauteing. "Pot Roasted Poussins agro dolce" on page 189 of this wonderful cookbook calls for 4 poussins, or baby chickens. I varied this recipe to use chicken tenderloins as that's readily available in the supermarket and you'll see the result on the page, Jamie Oliver Recipe For Chicken. I only ever cook easy healthy meals and this fitted the bill perfectly. The flavors of this easy dinner were rich and deep with a lovely delicate contrast of sweet and sour, using oranges, red wine vinegar with sultanas, chianti and smoked pancetta. I recommend this excellent book. Leave Jamie Oliver Cookbook to discover hundreds of scrumptious healthy easy recipes that will knock the socks off your family!